Update: 12-28-11: I changed the HTML tables into screen captures of the tables. Sorry for the awful formatting the first time. Sometime soon, I will have to address the CSS file on this site. When I starting looking for a way to build spells, I was immediately drawn to various systems used in Fudge, EABA, and OpenD6. For reference, I also look to the HERO system. Thanks to the work of Killershrike, there is a HERO System translation for every D20 and D&D spell into the Hero System. Why not build something like HERO? Like everyone else, my time is limited and I don’t forsee the ability to generate spells using such a detailed system. I love it, but not many of my friends do, especially my casual gaming friends. For elegance, I don’t think anything beats the EABA system. Add a few numbers and you can create just about anything. I bought EABA Stuff some time ago and I love building things with it. What I’ve found with EABA, however, is that spell effects are underpowered when compared to some D&D spells. For example, a spell like Magic Missile doesn’t feel like a first level spell when built with EABA. It feels like something wielded by a much more powerful mage. (Purify Food and Drink, however, does feel appropriately low-level. I like how EABA’s version of Purify Water can be used to distill alcohol.) The biggest hindrance to using an EABA type of system would be recreating the Universal Table without infringing on Greg Porter’s rights. The table is the equivalent of Product Identity for EABA. Any system for FUDGE is a lot of fun, but really narrative. I love narrative systems, but the Arcanist doesn’t seem a good fit for a narrative systems. Arcanists are skill-based mages. Working magic is like working leather – there is skill and technique that come together for a finished product. It is replicable and reliable. Just an ethos speaks to me of a more mechanic system with some amount of fiddly bits. In the end, I think a system like four-by-five could work, but OpenD6 provided a platform that feels closer to what I’m looking for. What about OpenD6? It covers a lot of ground like HERO, but has the simple math similar to EABA. It does have subtraction, which leads to issues in any building system. For example, an early version of Erin Smale’s Perfect Class document allows the building of a class that requires 0XP to advance in levels. The same is true in the OpenD6 spell building system – with enough money or time, you can effectively cast spells for free. I built a version of the D20 cantrip Ray of Frost that just 0 points to cast. Granted, it took gestures, material components, verbal components, a long time to cast compared to other cantrips, and the ray moved so slowly that the ray could be dodged easily. You may say that such a spell makes “free” casting useless, but with a guaranteed 1d3 damage and low skill required to cast it, you could see armies replacing archers with a bunch of folks that only know how to cast this ray. When there are a couple hundred bolts of frost coming at you, they are difficult to dodge. Sure it would be expensive, but a heck of a first wave attack as armies marched toward each other on the field of battle. So I had to do a little hand waving and say that all spells cost at least one spell point. This prevents player abuse, though a good GM should be able to mitigate this kind of abuse without resorting to such a rule. Another issue with the OpenD6 system is that the system requires several pages to explain. I haven’t streamlined past this issue yet. However, I hope that releasing this Alpha will generate some ways to streamline it further. There are about thirty points of manipulation in the full OpendD6 system and that seems like too many. The simplified system in D6Fantasy has about six or seven and that feels just about right, though I am currently using more. (I’m not looking at it right now, so I’m pulling these numbers from memory.) I have about nineteen criteria now, but any given spell only uses five or six. Many of the categories are only there for specialized spells. One other place of complexity is determining a value for the basic effect of the spell. Some effects are easy to chart – what’s the value for a spell that does 2d8 damage? (12). How about a value for adding +2 to Hit Bonus? (18). How about for manipulating 2 pounds of material? (2). Other effects are difficult to chart. What is the value for the effect of a spell like Air Walk? (Not even killershrike.net translated this one.) For Air Walk, specifically, walking on air like walking up and down a staircase is difficult to describe in terms of effect. Moving a man-sized creature upwards, and horizontally but not all at once and only about three feet at a time in both directions. Levitation is moving a something upwards. Teleportation is moving something in three-dimensional space. You can measure distance and mass of the object moved. Air Walk, though, is not really Teleportation when you take a step to move. Rather than attempt to calculate an effect for everything, I decided to make this a feature of one of the Mage classes. An Arcanist, a mage that can only use spells generated by the spell building system, can never cast Air Walk. A Wizard or Thaumaturge, however, could. Since the other two do not quite see magic as a skill, they can cast spells outside the artificial boundaries placed on magic by the Arcanist. So, yes, the Arcanist can generate spells with identical effects on a reliable and repeatable basis. However, the cost of this stability is placing artificial limits on what is possible with magic. So after all this rambling, I’ll get to the point. The spell building system is roughly based on the OpenD6 system. I’ve removed some of the options in an attempt to address the “subtraction” issue I mentioned earlier and to simplify the process slightly. I have also translated the OpenD6 Fantasy Spells as written, into a form that will work with Andras, as should work easily with any retroclone. I have a lookup table that determines values for mass, time, distance and speed. The original OpenD6 table used meters for distance; my table, however, uses feet. Determining a value for effect takes the most time. There are lots of guidelines and things for determining the value. So what are the guidelines for determining an effect? Let’s get the simple ones out of the way first. For Every +1 added to a skill score, the cost is one point. So to add 10 points to a Rouge’s Pick Pocket skill, the cost is 10 points. To add 8 points to a Mage’s Alchemy skill, the cost is 8 points. For every +1 Bonus to Hit, +1 Bonus to Damage or -1 to Armor Class, the effect value is 9 points. So if a spell has the effect of granting a -2 AC bonus to its target, the effect value is 18 (2 times 9). For Bonuses to a Saving Throw, a +1 Bonus costs 6 points. Every additional plus after that costs 3 points. So if a spell provides a +4 Bonus to the Breath Weapon saving throw, the cost is 15 points. (6 points for the +1, and 3 points per extra ‘plus’ which is 9 points. 6+9 = 15). For Bonuses to an Attribute, a +1 bonus costs 4 points. Every additional plus after that costs 2 points. Due to the nature of Exceptional Strength, any Bonus strength steps through the 18.01 through 18.99 per the Strength table, even if the target is not a Fighter. So, to provide a +2 increase in a target’s Wisdom score, the cost is 6 points. (Four points for the +1 and two points for the additional plus.) To increase a target’s Strength by 3 will cost 8 points. However, if the target already has 17 Strength, the final result will be 18.51 Strength, not 20. Damage: This is pretty straightforward. The effect value of a spell that does 1d8 damage is 6. Any entry with a blank space means that there is no correlation. So a damage based effect will never have a value of 7. Attribute: This table represents the cost of imbuing the value of an Attribute on a target. This is used in two different ways. The first way represents creating a golem or other automaton. To imbue your creation with the following stats; STR 19, DEX 8, CON 8, INT 5, WIS 8, CHA 8, the cost is 30. The other way to use it is to imbue a target with a specific attribute value. For example, a spell that imbues the target with the strength of a Titan (25) costs 24 points. Skill Score: This is for imbuing a specific skill score on the intended target. Keep in mind that Skills in Andras are not like skills in d20. You can do stuff that’s not listed on the character sheet. Skills are class specific abilities, not a measure of what you can and cannot do. For example, a mage could create a spell that provides the target the ability to any one of the Rogue skills or use the Bard’s Lore skill. d% Success: This column is identical to the Skill Score column, but the format is expressed in terms of percentage chance of success. So, to imbue the target with an ability that provides a 86% chance of success, the value is 15. This is exactly the same as imbuing the target with a Skill Score of 23. This column is also used to get the effect number of Detection spells like Detect Magic, Detect Invisibility, Detect Life, Detect Undead, etc. Since most detection spells provide a 100% chance of success, the effect value for most detection spells is 22. Saving Throw: This column represents providing someone with a specific Saving Throw score for any one Saving Throw category. 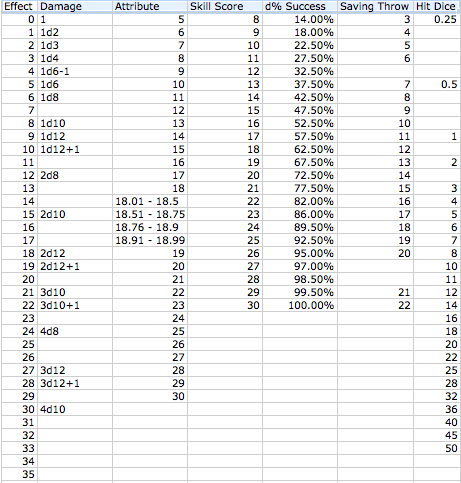 The numbers correlate to the d% Success column. This can also be used to provide a specific saving throw versus a specific effect, for example, a Saving Throw against fire, psionics, ice, etc. This can also be used to calculate immunity. For example, to cast a spell that makes the target immune to fire, the effect is 22. This can also be used to provide a Saving Throw to spells that normally do not allow saving throws. Hit Dice: This column represents the total Hit Dice for the creature(s) summoned. This column is used for summoning a 7 HD elemental, but not used for creating a 7HD golem or automaton. The last table covers time, distance, mass and speed. It is also used for more than determine a value for the effect of the spell. It is also used to determine the range, duration, and speed of the spell. Note that it does not cover volume. That is covered in Area Effect criteria in the spell building system. This can take a bit of getting used to, so here are some walk-through examples. Lets say that I want the effect number of 30 seconds. I find 30 on the chart and then look to the left to find its value. The effect number for 30 is 7. Since I am measuring seconds, I do not have to adjust the effect number. Now let’s say I want the effect number of 30 minutes. Again, the effect number for 30 is 7. Looking at the chart, it says that minutes requires a Plus 9 adjustment. So I add 9 to the effect number 7 to get 16. The effect number for 30 minutes is 16. Let’s say that I have a spell that affects 2 gallons of something. On the chart, I see that the effect number for 2 is 1. Then I see that the adjustment for gallons is plus 11. That makes the effect number for gallons 1 + 11 or 12. Let’s say that a spell enables the target to move 60 feet per round. Looking on the chart, the effect for 60 is 8. The adjustment to indicate feet per round is Plus 5. Therefore the effect number for moving 60 feet per round is 13. Finally if all these tables do not help you generate an effect number for what a spell does, look at spells already created. Multiply the level of the spell by 10 to get the desired effect. There are more guidelines for Charm, Control and similar spells, but that will be in another post. Let me know what you think of this system so far. All feedback welcomed.